The College of Cross-Cultural and Multidisciplinary Studies presents ‘english-TALKmon’ for the fourth term, according to the schedule attached below. ‘english-TALKmon’ will be available from Monday to Friday from 12:00-12:40, and 16:10-17:10 every weekday except for the national holidays in classroom 1D，in the College of Cross-Cultural and Multidisciplinary Studies building. Faculty and staff are also welcome for the lunchtime session. Feel free to join the activity, according to the schedule attached. You can have lunch in the classroom for the lunchtime session. Come and enjoy the conversations with the College teaching faculty. 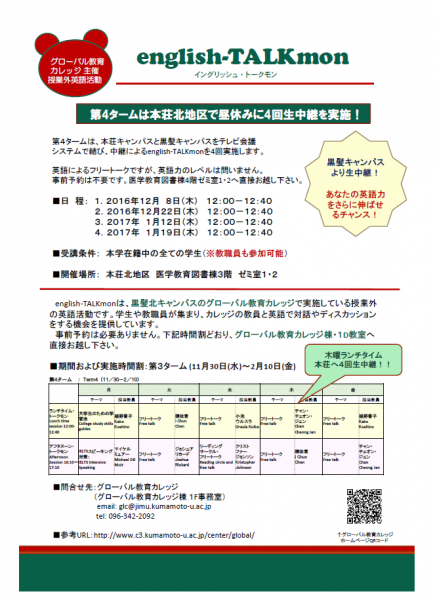 ・Participants will receive a prize after reading! ・Watch and learn as Korean international students make toppoki, sudubu jigae, and chijimi! ・Enjoy eating the food afterward! Traditional games will also be held throughout the day. Feel free to join any time! Presentations about study abroad will also be held throughout the day. Participation is free of charge! Anybody is welcome to join. If you would like to apply, please click on the following link to register. Walk-in participation is also accepted.